Following the manufacturer’s instructions, fuse the Shape Flex interfacing to the wrong sides of the Exterior Front, Exterior Back and Exterior Gusset. Fuse Shape Flex to wrong side of Strap Loop. Layer Lining Main Panel (right side down), Soft & Stable, and Exterior Front (right side down up). Align the raw edges and pin in place. Baste around the edge of the panel with a 1/8” seam allowance. Repeat with Exterior Back. If you are using a heavier weight fabric like a canvas or vegan leather, you may forgo the interfacing. Fold Strap Loop in half, wrong sides together (WST), aligning the edges and press. Fold the edges in again to meet the crease and press. Re-fold along the first crease to create a 6” long piece of 1” wide double-fold tape. Topstitch along both folded edges of the tape with a 1/8” seam allowance. Cut your tape into 2 3” pieces. Thread each piece through 1” triangle ring and fold in half. Fuse Shape Flex to the wrong side of both Exterior Zipper Gusset Pieces, aligning the long edges on one side. Fuse the second layer of Shape Flex directly on the top of the first layer. Fuse Shape Flex to the wrong side of the Exterior Bottom Gusset. Layer Lining Bottom Gusset (right side down), Soft & Stable, and Exterior Bottom Gusset (right side up). Align raw edges, pin, and baste around the edges with a 1/8” seam allowance. Place the Exterior Zipper Gusset pieces RST, aligning the long edges without interfacing. Pin and baste along this edge. Press seam open. Repeat with lining Zipper Gusset pieces. Lay Exterior Zipper Gusset right side down. Position the 10” zipper on top with right side down. Center the zipper teeth with the basted seam from the previous step. Pin in place. Using your zipper foot, baste the zipper in place with a 3/8” seam allowance. Place Exterior Zipper Gusset right side down. Lay Lining Zipper Gusset on top with WST. Align the raw edges and center the basted seam over the zipper coil. You may need to feel for it with your fingers to check its position. Pin in place. With your zipper foot, sew along the basted seam with a ¼” seam allowance, backstitching at both ends. You should be sewing through the Lining Zipper Gusset, zipper tape, and Exterior Zipper Gusset. With a seam ripper, carefully remove the basting stitches from step 13-14. Trim the zipper tape that extends past the Zipper Gusset. Position one of the folded Strap Loops on top of the short edge of the Exterior Bottom Gusset, aligning the raw edges and centering the loop width-wise. Baste in place with a ¼” seam allowance. Repeat with the remaining Strap Loop on the opposite end of the Bottom Gusset. Place the Zipper Gusset and Bottom Gusset with exterior sides together, aligning the short edges. Pin both ends. With the zipper foot, sew to form a loop, backstitch at both ends. Sew directly on the top of each seam once more for strength. Trim seam to 3/8” and press towards Bottom Gusset. Topstitch Bottom Gusset 1/8” below each seam made in the previous step, backstitch at both ends. the seam allowance. The top folded edge of the tape should just barely cover the stitched gusset seam. Pin in place. Hand stitch in place with a ladder stitch or blind whip stitch. Repeat with second gusset seam and piece of bias tape. Fold your Exterior Front and Back Panels in half vertically to find the centers and mark with a pin on the top and bottom edges. Fold your gusset in half, matching up the gusset seams, to find the center of the Zipper Gusset portion and Bottom Gusset portion. Finger press to form creases and mark each end of the two creases with a pin. With exterior sides together, align the raw edges of your gusset and Front Panel. Match center points and pin. Match the notches on your Front Panel with the gusset seams. Pin around the entire panel, easing the gusset around the circle. Take your time and sew slowly, backstitching at both ends. Trim your seam allowance to 3/8” and clip your curves. Unzip your zipper. Repeat the previous step to attach the Back Panel to the gusset. Unfold one side of your bias tape and fold the end back 1/4'”. With RST, please the bias tape against the edge of the Gusset / Front Panel seam, aligning the outermost crease with the seam. Pin bias tape all the way around the seam. When you come back to the start of the bias tape, overlap the front folded end by about 2”. We leave this overlapped portion a little long in case of any shifting. Sew the bias tape to the bag by stitching in the crease. Start sewing at the folded end (do not sew through the overlapped end) and continue all the way around the seam. Just before you reach the overlapped portion of the tape, trim the overlap to ½”. End by sewing through the overlapped portion of the tape. Repeat the previous step with your remaining bias tape on the gusset / Back Panel seam. Fold the bias tape over the gusset / Front Panel seam and sandwich it between the tape. Hand stitch the bias tape all the way around the opposite side of the seam with a ladder stitch or blind whip stitch. Repeat the previous step on the gusset / Back Panel seam and turn your bag right side out. Clip purse chain to triangle rings. Amber, the Designer Extraordinaire over at Adventures in Stitcherland, has been sewing since she was 9 years old. When she's not creating stunning embroidery designs, she is elbow-deep in all things fashion. 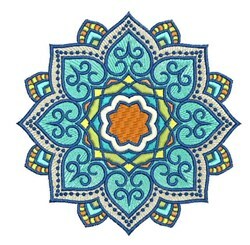 Hello, I found this article/project at EmbroideryDesigns.com and thought you might find it of interest.